PreiTech Corp. owner and project instructor Mike Eastergard helps CIM students construct a Sept. 11 memorial at 2010 World of Concrete. A memorable fieldwork project took top senior CIM students at MTSU and CSU Chico to World of Concrete in Las Vegas last February. Under the tutelage of Ed Gruetzner, a decorative concrete practitioner who's also a retired firefighter from New York City, and Michael Eastergard, owner of PreiTech Corp., a concrete form company, students from both MTSU and Chico State created a bittersweet memorial to members of two companies of firefighters who were lost at the World Trade Center on Sept. 11, 2001. "It was touching, listening to the fire-station chief talking about the firefighters he'd lost on 9/11, " says Dr. Heather Brown, of MTSU's CIM Program. "The students were so proud to be involved. " The team created concrete silhouettes of two towers ranging to nearly 10 feet tall. (A two-inch height difference between towers mimics the effect of perspective.) 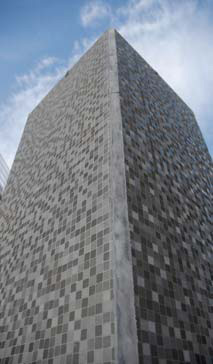 Glass-fiber reinforced concrete was cast against faceted casting mats to produce a dramatic reflective mirrored finish. Onto that finish was engraved the names of the fallen heroes and the story behind the event. Unique casting mats were created for the project by Eastergard. The CIM students who worked on the project were seniors. "It was an entirely extracurricular undertaking for a select group of students, " says Dr. Tanya Komas, CIM Program, CSU Chico. "They'd taken the decorative class, so they had some knowledge of the process, but they still had to learn how to do GFRC. " 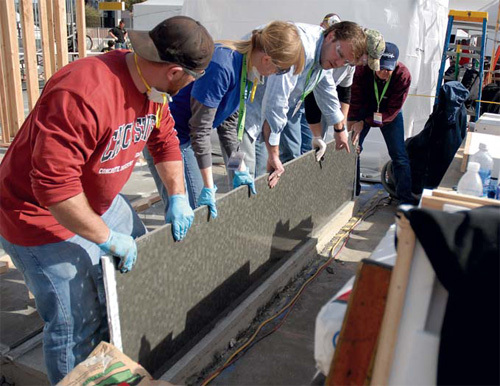 Students practiced with samples of the GFRC panels before the show, then spent their in-show time erecting forms, fitting them together and sanding them, reports Brown. The memorial was erected, displayed and then dismantled all under the keen observation of show attendees. It will be reinstalled and officially dedicated at a memorial park in New York across the street from one of the firehouses affected. reports Brown.